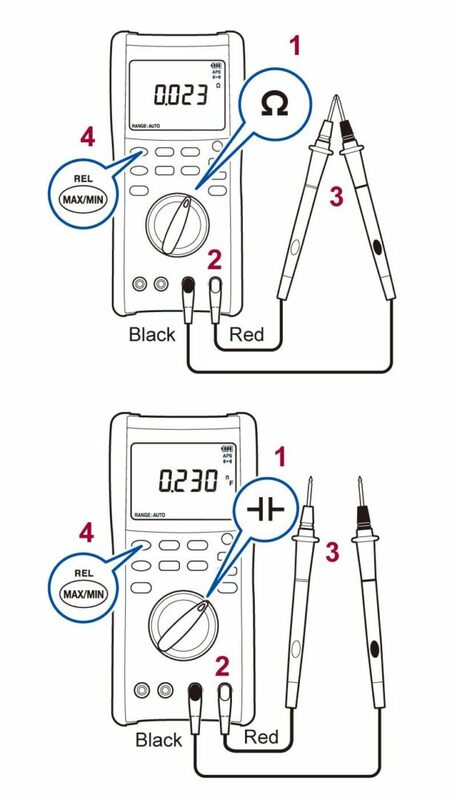 This page provides an easy-to-understand explanation of how to use electrical testers and digital multimeters (DMMs). Please use it to gain an understanding of how to use these instruments, and refer to it when choosing the model that’s right for your application. Hioki digital multimeters are safe, high-quality products. The figure illustrates the waveform characterizing the type of overvoltage that occurs when a solenoid valve operates. In this example, you can see that an impulse voltage of close to 1000 V was generated on the 100 V AC line. Impulse voltages such as this one can occur in manufacturing plants with numerous inductive loads or in the event of a lightning strike near a location where a multimeter is in use. For an instrument to be used in a given measurement category, it must have adequate capacity to withstand the impulse voltage (see table) that can be expected based on the location of use (CAT IV, CAT II, or CAT II) and its voltage relative to ground (circuit voltage). For example, CAT II (300 V) multimeters are required to be able to withstand an impulse voltage of 2500 V based on a voltage to ground of 300 V. In locations (i.e., categories) such as industrial manufacturing lines where a large impulse voltage described above is possible, it’s good practice to choose a multimeters with as high a measurement category as possible. A detailed description of each category follows. 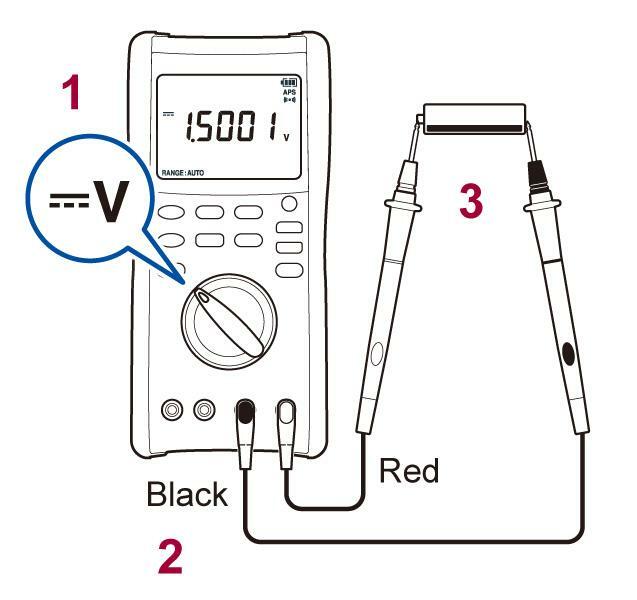 When using a digital multimeter to measure current, the multimeter should be connected in series with the circuit being measured. 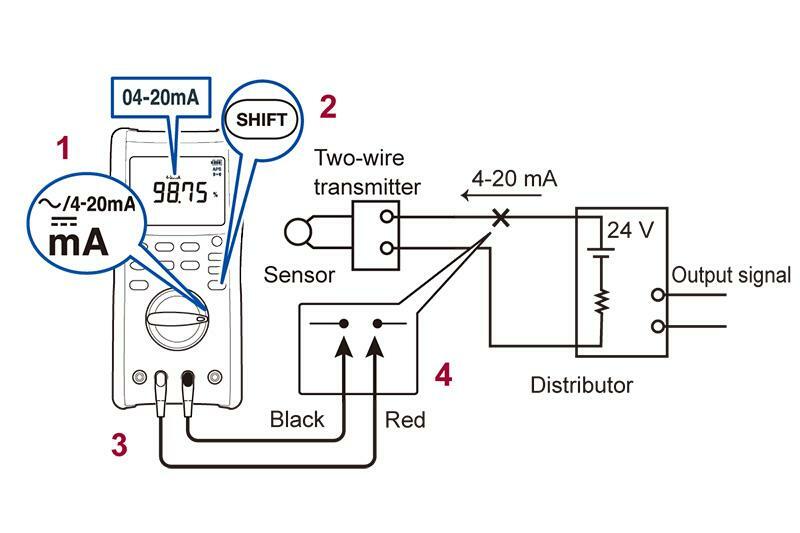 To minimize instrument loss (resistance) caused by connecting the digital multimeter, the multimeter’s current measurement circuit is designed to have low impedance. 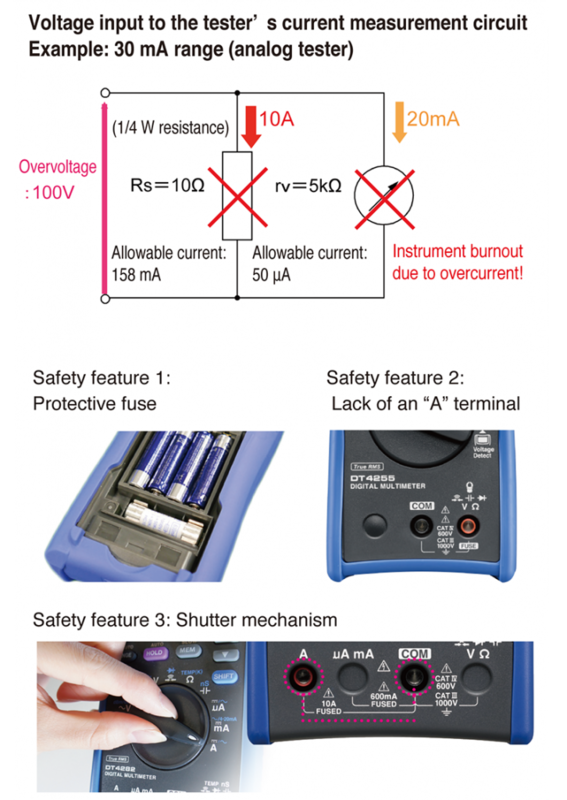 If the digital multimeter is mistakenly connected in parallel to the circuit’s power supply, the supply voltage will be applied across the multimeter’s terminals, causing an overcurrent to flow and the instrument to burn out. 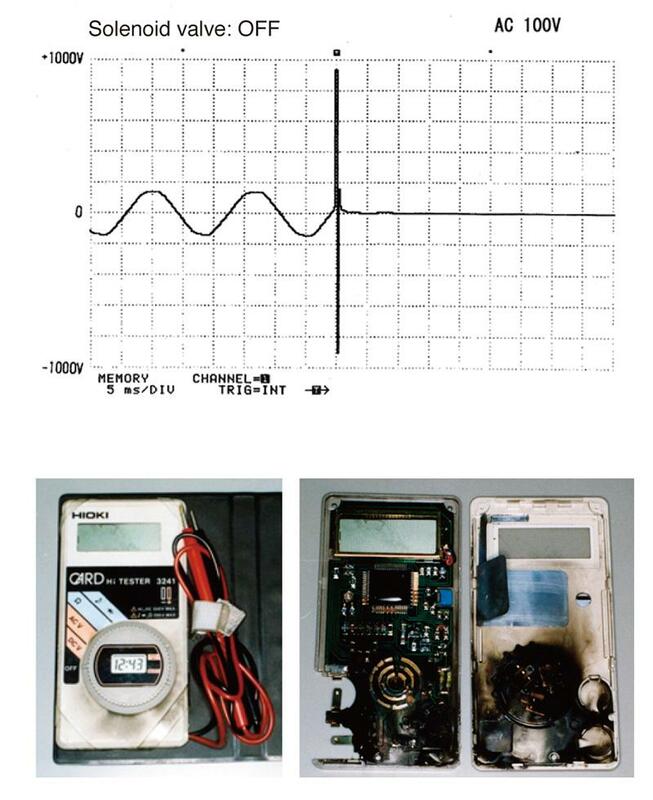 To prevent such damage, most multimeters incorporate a protective fuse. Additionally, some products intentionally omit a current terminal (“A” terminal) or incorporate a mechanism linked to the rotary switch so as to prevent a test lead from being inadvertently connected to the wrong terminal. 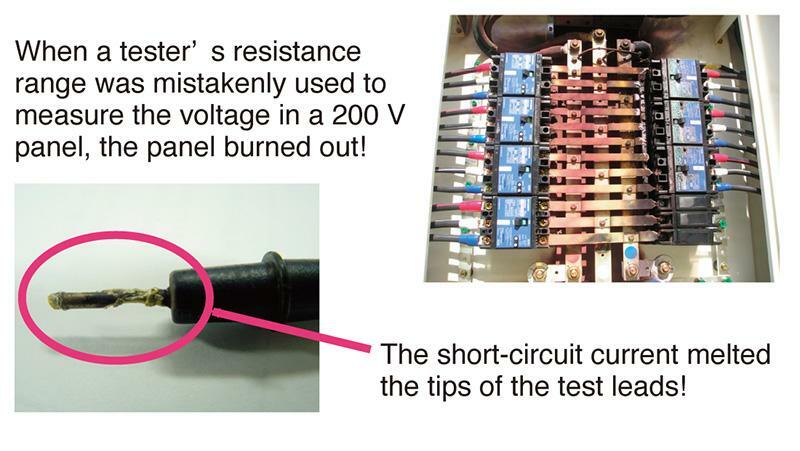 Because the digital multimeter’s resistance measurement circuit has low input impedance, application of a voltage across the test leads could burn out the instrument by causing an overcurrent to flow inside it, and the resulting short-circuit could in turn cause the distribution panel to burn out. Hioki digital multimeters have an internal overcurrent protection circuit that minimizes any overcurrent caused by voltage input, and they are designed to withstand an overvoltage for up to 1 minute. 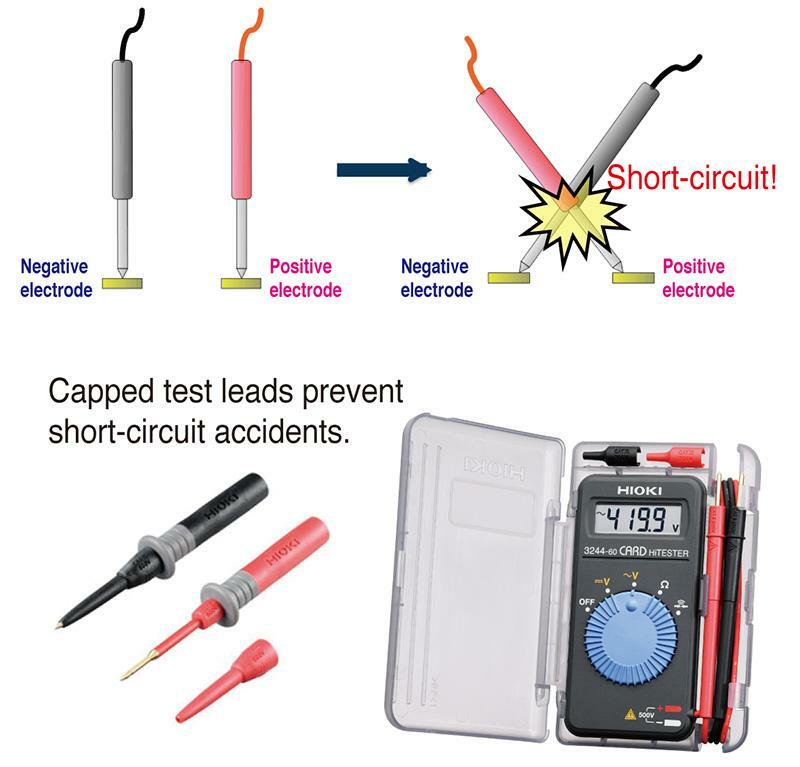 Use of test leads with long metal tips can cause a short-circuit accident when measuring voltage. 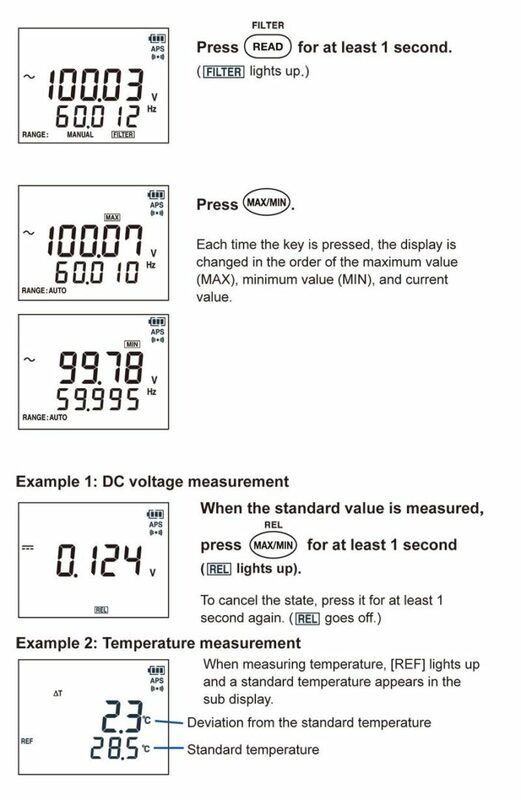 All Hioki digital multimeters use capped test leads that have a shorter exposed metal area at the tip. The rotary switch is used to switch among measurement parameters (AC voltage, DC voltage, continuity check, resistance, capacitance, current, etc.) 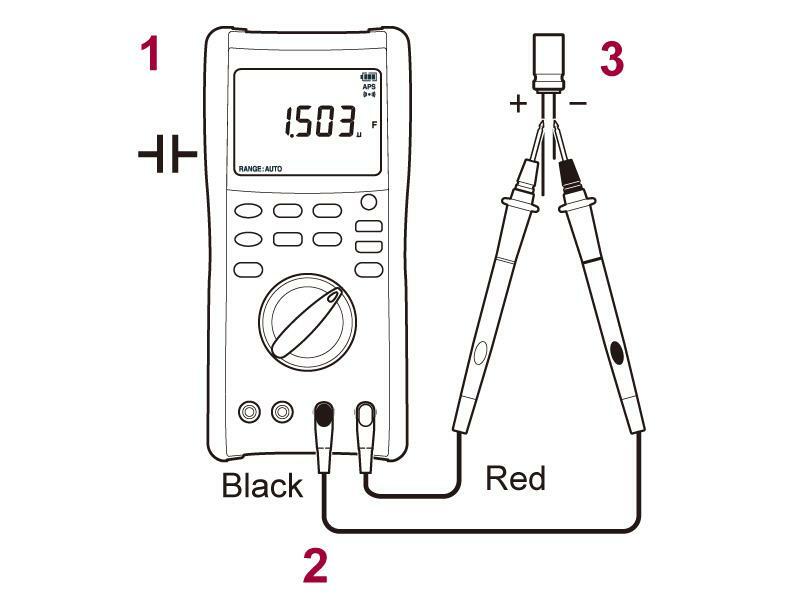 depending on the application in which the digital multimeter is being used. The terminals into which the test leads (measurement cables) are inserted vary depending on the parameter being measured. 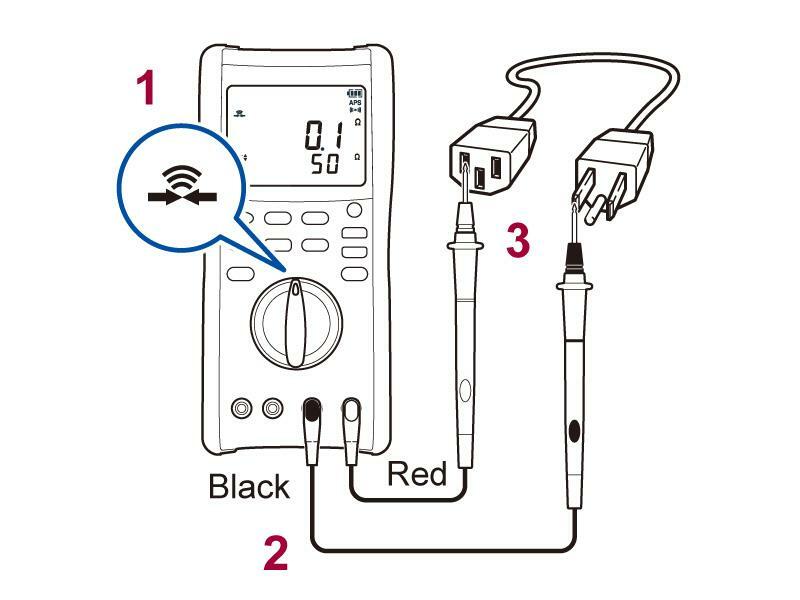 For all parameters other than current, the red test lead is connected to the “VΩ” terminal, and the black test lead is connected to the “COM” terminal. The operation keys are used to measure DC and AC voltage and current, to access other measurement parameters such as temperature and diode check functionality, and to utilize other functionality such as holding measured values. *This description uses the DT4282 for explanatory purposes. Please check the product specifications for other models as specifications and settings vary. Caution: Do not connect either test lead to the “A” terminal. Some models have a shutter function designed to prevent the inadvertent connection of a test lead to the “A” terminal, while other models lack an “A” terminal entirely. 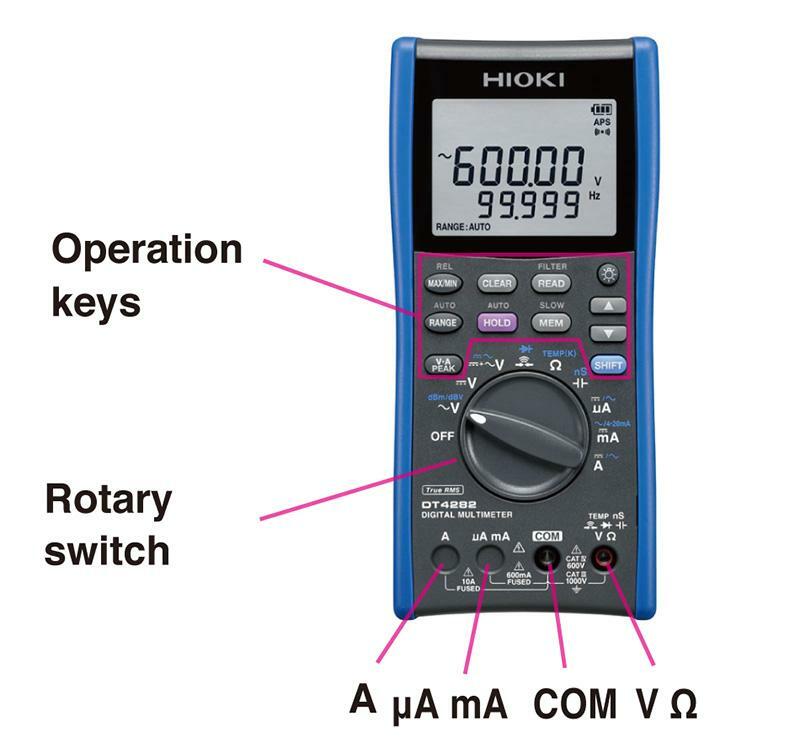 Hioki digital multimeters also have an internal fuse designed to protect against the possibility of a test lead being inadvertently connected to the “A” terminal. For more information, please check the product specifications for each product. 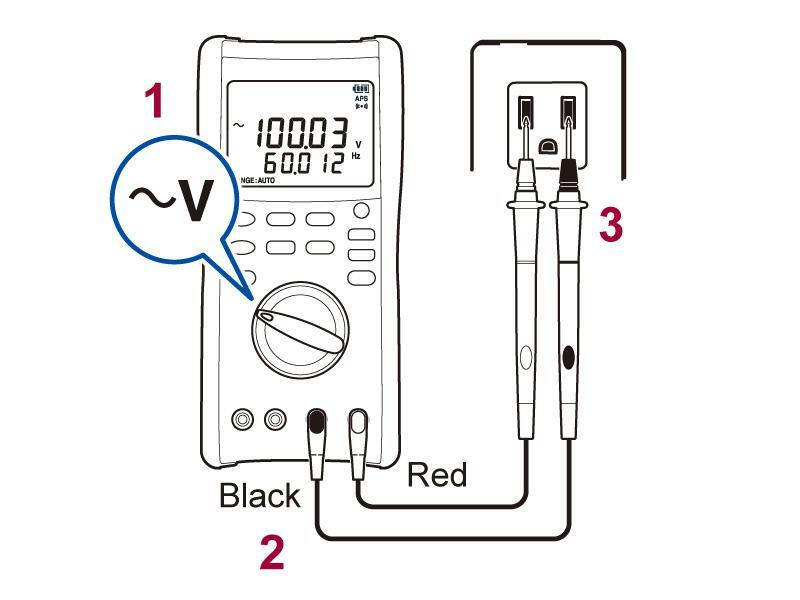 Verify that the voltage of the circuit being measured falls within the digital multimeter’s input specifications. If continuity is detected, the digital multimeter will indicate that fact on its display and beep. 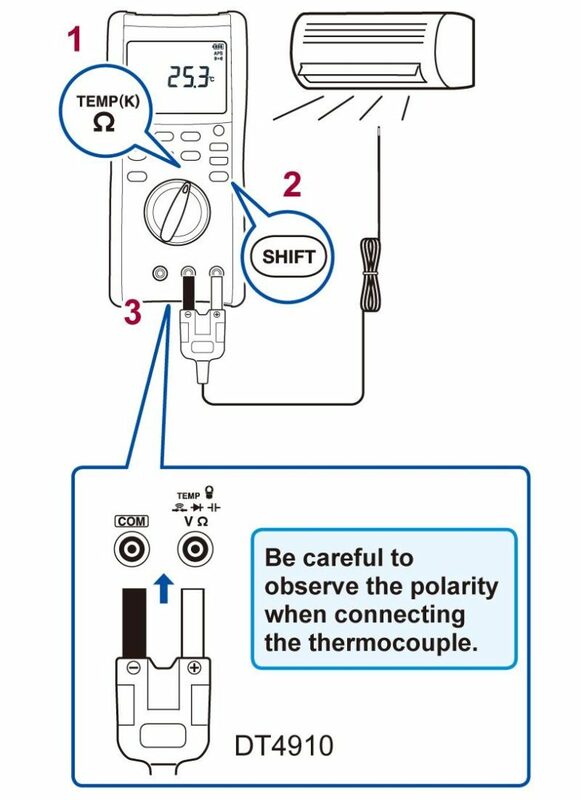 If continuity is not detected, for example due to a wiring break, no value will be indicated, and no beep will sound. Caution: Shut off the supply of power to the circuit being measured before measurement. 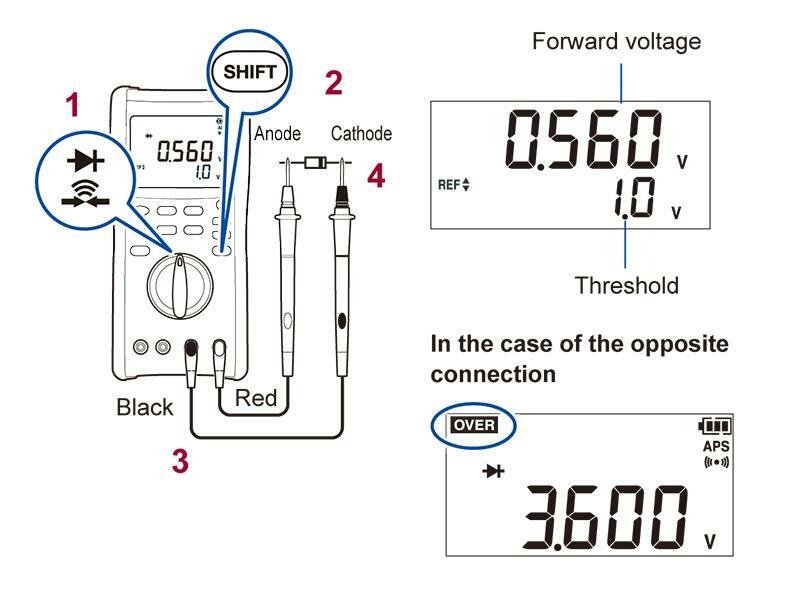 The digital multimeter will show the diode’s forward voltage if connected in the forward direction and “OVER” if connected in the reverse direction. *Other K thermocouple sensors may also be used. 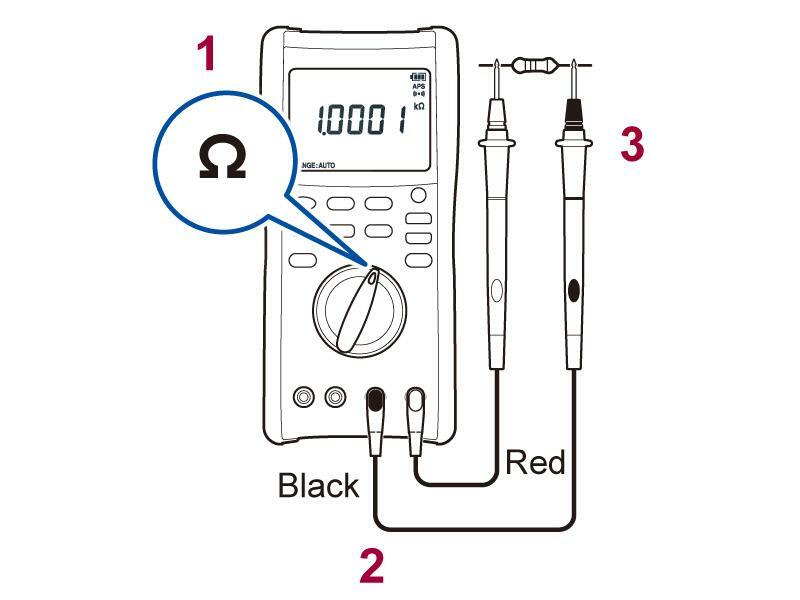 To measure current in a DC circuit, set up the digital multimeter as described below. The digital multimeter should be connected in series between the load side and the power supply side of the circuit by cutting the wire indicated with an “X” in the figure. 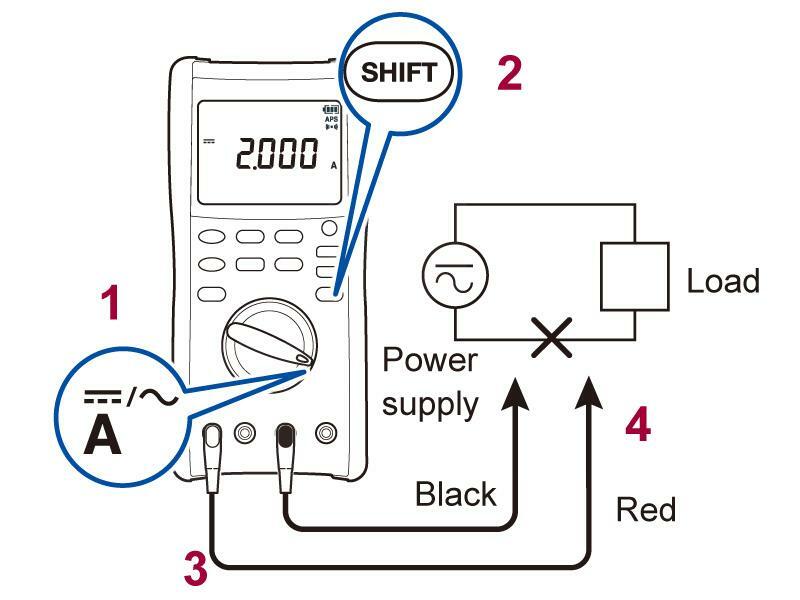 Caution: Shut off the supply of power to the circuit being measured before measurement and then turn it back on after connecting the digital multimeter. Exercise care not to apply a voltage (i.e., not to connect the digital multimeter in parallel with the power supply). Check the maximum current value that the digital multimeter can measure and only use it to measure circuits with currents that are less than or equal to that value. 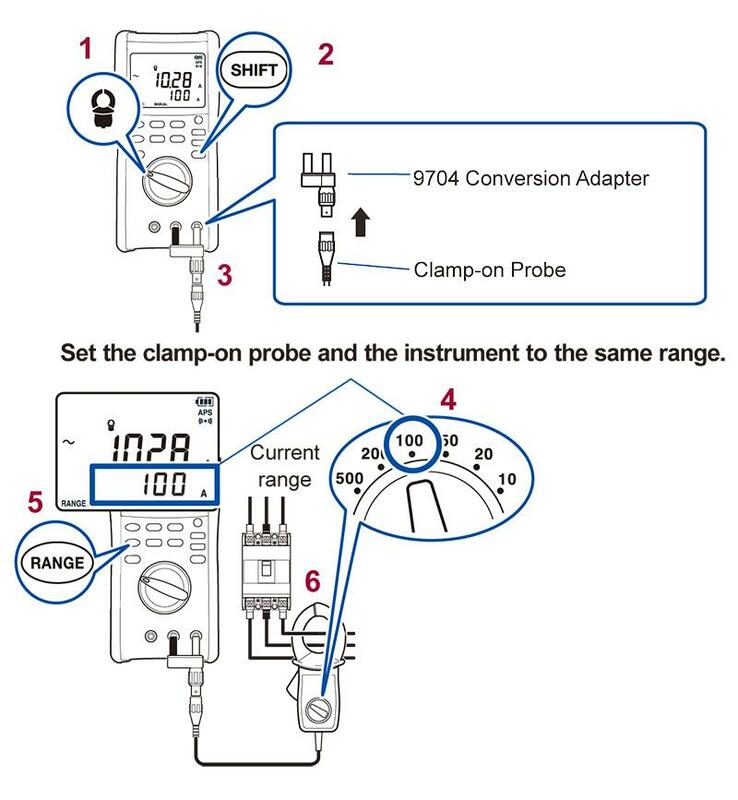 Caution: If the clamp-style sensor’s range changes during measurement, the digital multimeter’s range must be changed to reflect the new value. 1. Rotary switch position: Set to the function for which you wish to perform zero-adjustment (“1” in figure). 4. Zero-adjustment: Press and hold the MAX/MIN key for at least 1 sec. (“4” in figure).